"Building Brands and Moving Projects Forward," that is the motto of public relations firm Watkins Strategies, and in this quiet town they did just that. 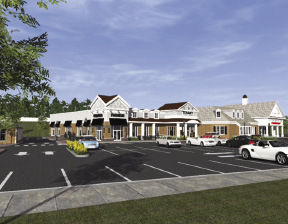 Grove Property Fund, owners of the Longmeadow Shops, has a vision to improve their existing shopping center. Their plans called for additional 21,096 s/f of shared retails space, as well as improvements to parking and pedestrian safety. Their plans also required a zone modification from residential use to business use, and therefore a 2/3rds approval from residents of the town. Grove Property engaged Watkins Strategies who specializes in public outreach and media relations and also engaged Phase Zero Design. Built in 1963, Longmeadow Shops was once owned by Friendly's Ice Cream co-founder Prestley Blake. Grove Property Fund purchased the Shops from Blake in 1994, and viewed a proposed zone change as a critical step towards bettering their customer experience in a competitive retail market. The town meeting vote was held on February 3rd, and the zone modification was approved with a favorable vote of nearly 81%. A crowd of nearly 900 residents, more than double the amount that turned out at the town's fall town meeting, packed the high school gymnasium to lend their support to the project. 729 residents voted in favor of the proposed zone change on a 1.8-acre parcel. "We were very excited that the residents spoke loud and clear that they want a better shopping center," said Grove Property Fund partner Steve Walker. "This type of turnout was unprecedented, and I credit Watkins Strategies for their relentless efforts to educate the community about our plans and intentions." Watkins Strategies spent over five months with continuous efforts to get out the word on the proposed expansion. This included hosting public information sessions, door-to-door canvassing, engaging the local media and aggressively working to promote the Special Town Meeting vote and the importance of participation. "The development team including Grove Property and Phase Zero laid out a very sensible plan, and our challenge was to present it very clearly to the community, value their feedback, solicit their support, and look to engage them as ambassadors of our vision," said Watkins Strategies president Matt Watkins. The project architect, Phase Zero Design, played a key role with presenting this project to the community. Grove Property Fund intends to finalize plans with the town over the next several months in an effort to move the project forward.